At the end of this month, the tundra finally turns green and springs to life. The moose and reindeer have calved, and hundreds of varieties of wild flowers dot the hills. Throughout distant villages, most people will be leaving town for even more remote spots to hunt, fish and collect berries and greens for next winter. In every one of those far-flung wilderness camps, you’ll find a battery-operated radio, and virtually every radio will be tuned to KNOM. Because these locations are free of man-made static, our signal is listenable far beyond our village coverage area. Thank you for making KNOM many folks’ only contact with civilization! 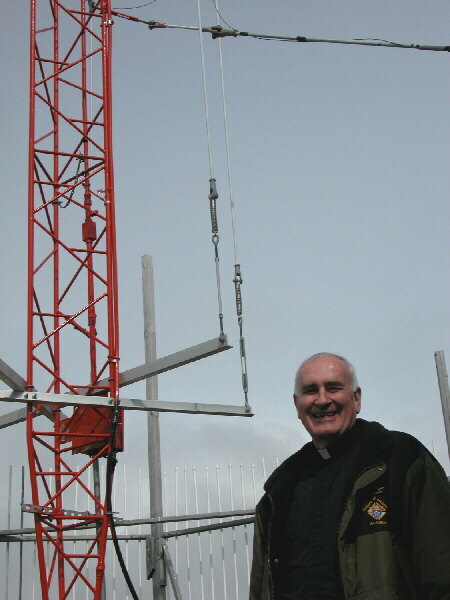 TOWERING ISSUES: (left): Bishop Donald Kettler inspects the 230-foot KNOM tower, three miles east of Nome. It was the first time he’d had the opportunity to tour the site. Bishop Kettler, who is the licensee of KNOM, was in town to administer the sacrament of Confirmation. Among the Confirmees were Ric and Lynette Schmidt’s eldest children, Nick, Jenna and Tara. It was a quick trip for the bishop, who nonetheless took time to visit with KNOM’ers, who hold him in great esteem. BRIGHT IDEA: This is truly the Land of the Midnight Sun. In fact, we have not seen true darkness since April 8th, and won’t again until September 3rd. TRANSLATOR PROGRESS: Both of Alaska’s U.S. Senators are becoming involved with the KNOM translator project. We cannot imagine that the FCC will fail to approve them. 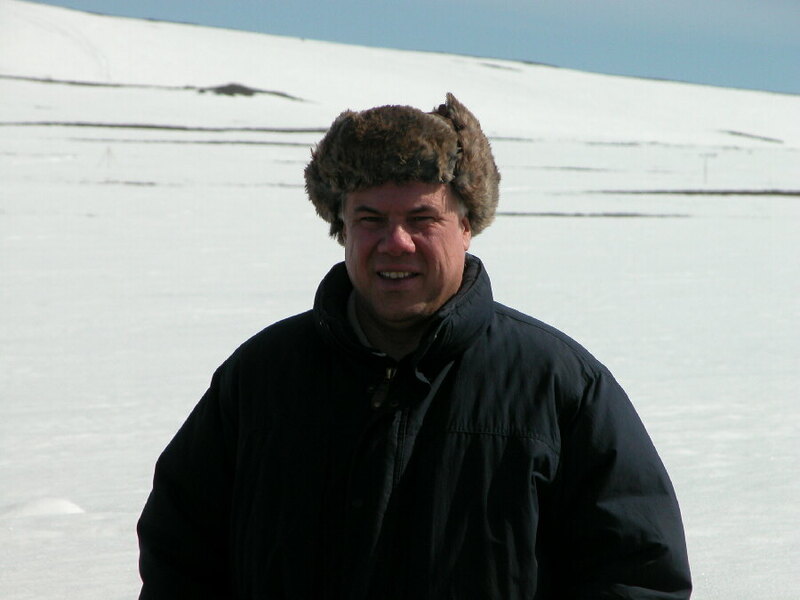 Meanwhile, general manager/engineer Tom Busch had laid out a trip by small plane to scope out eight of the more remote villages. Western Alaska’s typical May weather had other ideas, however, carrying snow, drizzle, low clouds and fog for hundreds of miles. The trip is tentatively re-scheduled for September. INSPIRATIONAL SPOT: Patience is to let your light shine, even after your fuse is blown out. SOMETHING’S AFOOT It’s the traditional Eskimo foot pull, an incredibly physically challenging game in which only the hands and one foot are allowed to touch the floor. Volunteer Amy Flaherty attended the competition in the village of St. Michael. It’s 124 miles southeast of Nome, a Yup’ik Eskimo community in the heart of KNOM listening country where most of the village’s 413 residents have a Russian trader or two in their ancestry. “MY FRIEND” is the Catholic magazine for kids. In the May issue, you’ll find a three-page article on KNOM’s volunteers. 17,000: That’s how many inspirational spots KNOM has broadcast since January, along with an equal number of educational ones, thanks to you. Please consider adding missions like KNOM to your will. We prayerfully place all bequests into funds that provide for future emergencies and major improvements. INSPIRATIONAL SPOT: God should be our steering wheel, not our spare tire. IVU (left): Pronounced "EE-voo," it's a rare phenomenon in which wind and ocean currents pile broken sea ice onto shore, accompanied by a chugging sound, similar to that of a steam locomotive. 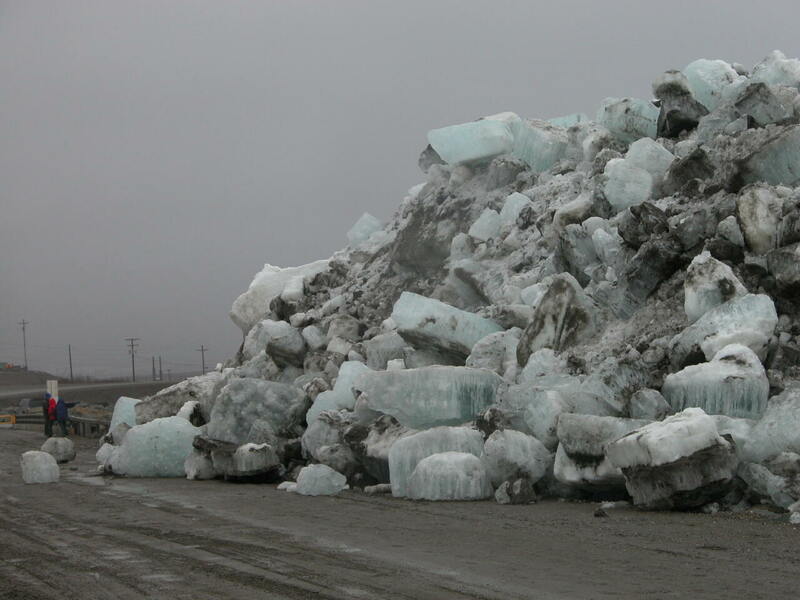 On Mother's Day, it took the Bering Sea only two hours to bulldoze hundreds of tons of blue ice onto a thousand feet of the Nome port's causeway. At the very left of the top photo, you might be able to make out three people. 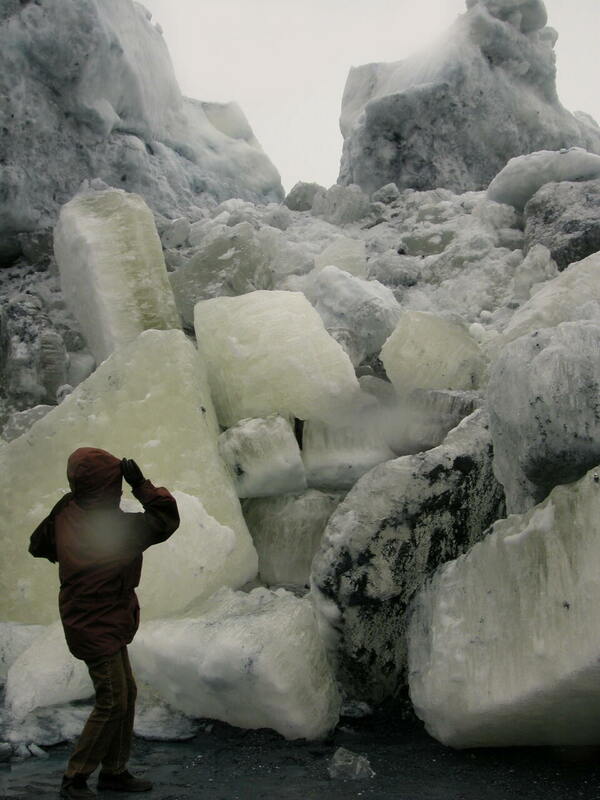 In places, the mountain of ice blocks stood thirty feet high, an awe-inspiring sight. (Left) Florence Busch inspects Mother Nature's ice debris. Many chunks were the size of pickup trucks. Nome experiences an ivu every fifteen years or so, but this one dwarfs any in memory. City officials planned to just let it melt. (Left) Looking back toward a foggy Nome across ice-choked water. 403 years: As of today, that's the time that KNOM volunteers have donated to the mission since its inception in 1966. The current KNOM staff stand on some mighty tall shoulders. We ask that once in a while, you remember all of these wonderfully generous people in your prayers. Thank you! KNOM is the oldest Catholic radio station in the United States, strong thanks to you. INSPIRATIONAL SPOT: Don't tell God how big your problems are. Tell your problems how big God is. INSPIRATIONAL SPOT: God did not come to take away the pain but to fill it with His presence. “ON GUARD:” KNOM program director Ric Schmidt (right, in early May) is the newest member of Alaska’s Employer Support of the Guard and Reserve Committee. The committee’s job is to increase and maintain support by business and other employers for their workers who belong to the National Guard and Reserve. Ric represents Nome and western Alaska. In April, the Guard flew him, eight fellow committee members and 29 employers on a KC-135 tanker to the Naval Air Station Joint Reserve Base in Fort Worth, Texas for two days of briefings. Last year, Ric was honored with a meritorious leadership award from the Guard for his efforts on their behalf when he was president of Nome Rotary club. “I’m happy to help serve the people who sacrifice so much to keep our country safe and secure,” he says. THIRTY YEARS AGO: June 23, 1974, on a home-made raft in the traditional Nome River raft race, the KNOM men place a close 25th. Much to their chagrin, the KNOM women’s team had finished seven places higher. 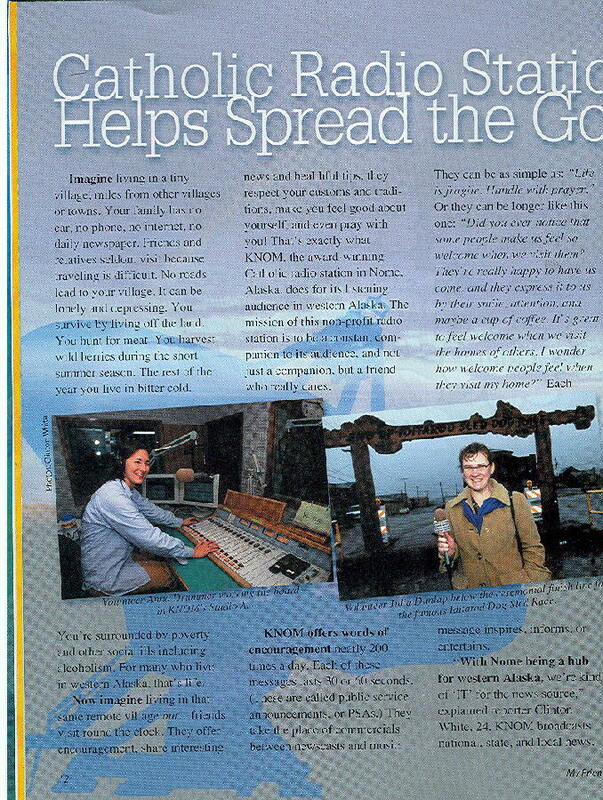 Thus far, KNOM radio volunteers have been recruited through classified advertisements in “Broadcasting” magazine. Starting this season, and for the next twenty years, they are recruited by the Jesuit Volunteer Corps. PRIDE COMETH: This issue goes to press before the Boston College graduation and we hope to have a photo next month. Recently, general manager Tom Busch reflected upon his honorary degree. “Shortly after I learned about it,” Tom says, “my mouth was wide open to discover that other recipients include John F. Kennedy, Marian Anderson, Sir Alec Guinness, Earl Warren, Arthur Fiedler, Adlai Stevenson and Buckminster Fuller. I was sitting in my office, busting my buttons with pride. At the time, Father Paul Cochran’s program ‘The Lord Be With You’ was playing on KNOM. Suddenly and distinctly, Father Paul said ‘the honors bestowed by human beings are of no consequence.’ So I was put in my place! Thank you once more for your prayers and your support. You and your loved ones remain in our prayers, also. May Our Lord reward you a thousand times over for your generosity.